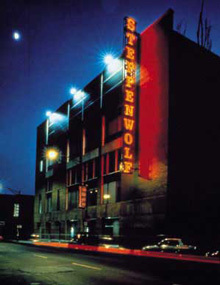 A favorite Chicago icon is the 35 year young Steppenwolf Theatre. They are a theatre that was born in 1975 in an 88 seat basement auditorium of a Roman Catholic Church located in Highland Park, IL. 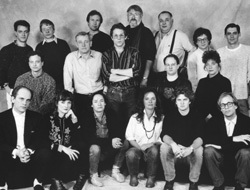 When the theatre moved to Chicago in 1980 they were met with critical acclaim for shows such as “True West” and “Orphans”. These engagements were so popular that the shows were catapulted to New York’s off Broadway theaters allowing such actors as Gary Sinise, John Malkovich, Laurie Metcalf & Joan Allen to jump start their careers. Of course the leap to broadway gave way to a 1985 Tony Award for outstanding regional theater and a 1990 Tony for Frank Galati’s adaptation of John Steinbeck’s novel “The Grapes of Wrath”. We found a recent interview of Ensemble Member & Director Frank Galati talking about Endgame by Samuel Beckett which is currently playing at Steppenwolf through June 6, 2010. The Steppenwolf Theatre continues to be an inspiration to young artists today. If a group of college alums can get together with determination and a dream then your goals can be reached beyond your expectations! *Special thanks to the Encyclopedia of Chicago for their insight.